Amebix are a band cloaked with such intrigue and myth that, for a long time, I wasn't sure that they actually existed. Forming in 1978 around the core of brothers Rob and Stig Miller, they released two albums and a handful of 7" singles before disbanding in 1987. They were a band spoken about on the fringes of both the punk and metal scenes, being one of the earliest bands to adopt both styles as their own. In 2009, Amebix came together to collate a history of the band in the form of a documentary style DVD. This served as a catalyst for the band to begin an entirely new chapter in their story, and we find them now on the verge of releasing new material for the first time in over twenty years. Sonic Mass is due for release on September 20th, and vocalist and bassist Rob Miller recently took the time to answer a couple of questions I had for him. Scene Point Blank: How did the reformation, as it were, of the band come about? Rob Miller: It really came about through the Risen DVD project that was supposed to have been a complete documentation of the Amebix myth, dealing with the unanswered questions and really wrapping the whole episode up. However, Roy (Mayorga - drums) flew over to help us record three tracks for the end of the DVD and it became glaringly obvious that we had stumbled into a new chapter, everything was aligned. It was the very last thing I wanted to get involved with, but once the doors were opened we had little choice but to follow on. Scene Point Blank: Was the making of a new album something you intended to do, or were initial plans just for a few shows and re-issues ? Rob: I think the idea of a new album was something we sidestepped for a bit,. We needed to get used to playing again first. I had spent 22 years without even touching a bass guitar, so the primary focus was on trying to make Amebix tight as a live band again. To that end we rehearsed for a solid week before every tour, so that we would come back out stronger than we ever were before. The new songs only really started to filter down after the European shows, when we had time and place at our disposal, firmly planted in the British countryside again and drawing the energy from the earth. 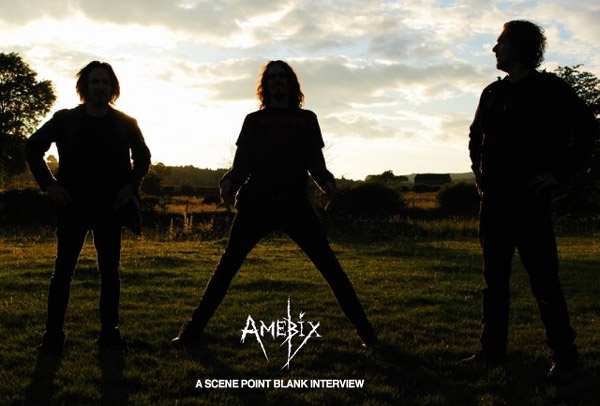 Scene Point Blank: The album wasn't something you'd really set out to do, so how was the idea of new music approached? How did you go about writing new music and was the process different to how you wrote in the past? Rob: For me it was the same, I have never written a song on demand. Inspiration is the key. We are at the mercy of the creative force, if something comes down then I have to try and find a way to interpret that through the very limited ability that I have personally. 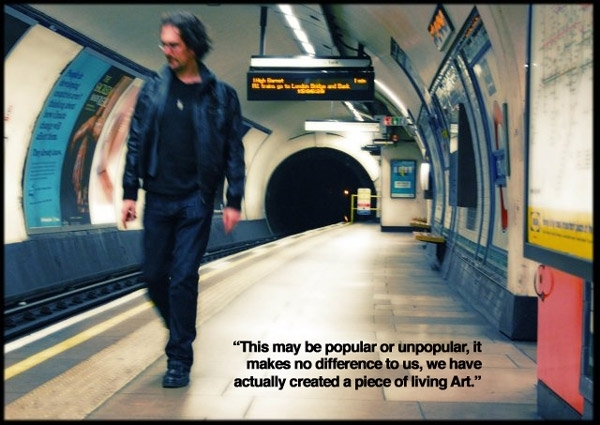 Roy has brought a lot into the album too, he has a grasp on composition that we never really had (yeah, I know, we still put out a 6 minute single, but.. Stig (Miller - guitar) brings moments of genius and his own inimitable style. Lyrically I am also very proud of this achievement, it has given us free rein to express ideas that were always at the heart of Amebix. Scene Point Blank: How did Roy become involved and were you fans of his prior to him joining the band? Rob: I had left the whole music “scene” some twenty years ago, and never listened or saw any new bands in that time. I simply moved to a remote Scottish island (Skye) and learned my art as a Swordsmith—this consumed me for all that time. The internet arrived and I began to get an idea that Amebix had become a cult phenomenon (everybody loves you when you're dead), and a personal myspace brought in people who wanted to contact me after all this time. Alicia from 13 (American doom band) suggested I befriend Roy Mayorga, and he seemed like an interesting and multi talented guy. But she disappeared for six months after Hurricane Katrina hit her home town. She anachronistically popped up again exactly when we had been talking about the idea of reworking old material for the DVD, something that was obviously not possible as Spider (ex-drums) cannot play anymore due to tinnitus. I came home from Ireland to find a message from Alicia with Roy's phone number, so just on the chance he might say “yes,” I phoned him. Roy arrived a few weeks later and spent a week with me on Skye, where he forged his own sword as an initiation, and we travelled to Ireland again when this story took off. Scene Point Blank: Do you have any major influences? And are they any different to the things that initially turned you onto the path of joining a band? Rob: There were so many back then, but I no longer have so many. We grew up with Bowie, T Rex, Brian Eno, and then the first wave of punk. I suppose what was most inspirational was John Peel, the radio DJ. He was absolutely the champion of all weird and wonderful music, and he opened my eyes to so much: when conformity was the enemy, and music was the Art. Bands that burrowed into my flesh were and always will be Black Sabbath, Accept, Mercyful Fate (the first two albums), Bad Brains, Stranglers, Killing Joke. I haven’t heard much lately that has found such a deep place. Scene Point Blank: What have the initial reactions to the new music been like ? Rob: We have played the single to about a dozen people: old diehard fans, and younger kids, and people who don't even listen to heavy music. The response has been very emotional from the old fans, we have brought back everything they felt about Amebix. It has totally vindicated this whole journey. Sonic Mass will totally open the gates, I really don’t think there is anything like this out there. I am stunned at what we have somehow achieved. This may be popular or unpopular—it makes no difference to us—we have actually created a piece of living Art. Scene Point Blank: Are you looking forward to getting it out there? Do you have plans to tour the album? Rob: The first priority is to allow people some time to get acquainted with the new material. I don't want to be a band that just plays the “old favourites,” so would like to tour the album as a work. This may take some planning, but I would expect us to be around in 2012. Scene Point Blank: Do you have any clear ideas as to how you want the band to progress after this record? What's the future for the band? Rob: No idea at all. We have to roll with the punches and walk on through when we can. We can only be aware of opportunities that present themselves. Personally I have a load more material that I would like to work on, but who really knows. Enjoy life in the moment and make the most of what we have now, I reckon. Scene Point Blank: Thank you for your time! Do you have anything else to add? Rob: I think that we recognise that there is an incredible amount of goodwill towards us out there. It has been a very difficult journey but it’s made easier by the real love and well-wishing that we have from old fans and new alike. So, thank you. Enjoy the music! Amebix released a new single on June 3rd, "Knights Of The Black Sun", the video for which can be found here. Words by Cheryl on June 6, 2011, 10:16 p.m.
Posted by Cheryl on June 6, 2011, 10:16 p.m.
Posted May 21, 2014, 7:33 p.m.
Posted Dec. 6, 2012, 10:10 a.m.
Posted June 3, 2011, 1:45 a.m.